College Farmhouse is a striking Cotswold stone farmhouse dating back at least to the 17th century, which is Grade II listed and which has recently been renovated to a very high standard. The redevelopment has combined period features like exposed beams, stone fireplaces, mullioned windows and shutters with contemporary interiors and lots of glass to bring in natural light to the house. The kitchen sits in a striking double-height barn and this space forms the hub of the house with links to the boot room and shower room, and stairs up to a games room/ bedroom. The oldest part of the property contains the impressive main reception rooms and the first floor has three en-suite bedrooms including the master bedroom suite, while the second floor has two further bedrooms and a family bathroom. The west side of the property has flexible accommodation currently used as a large home office and could be used as further entertaining space or a separate wing of the house. Outside, the south-facing lawn is sheltered and has good mature trees. A secluded and more traditional walled rear orchard garden comes with a large walnut tree and a pretty wooden playhouse. The gardens come to around half-an-acre. 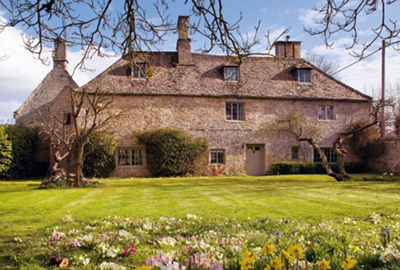 College Farmhouse is situated within the historic Cotswold village of Bampton, which has good local shops and a primary school and a library; the village was the setting for some of the village scenes in Downton Abbey. The guide price is £2m. For further information please contact Savills on 01865 339 700 or visit www.savills.co.uk.